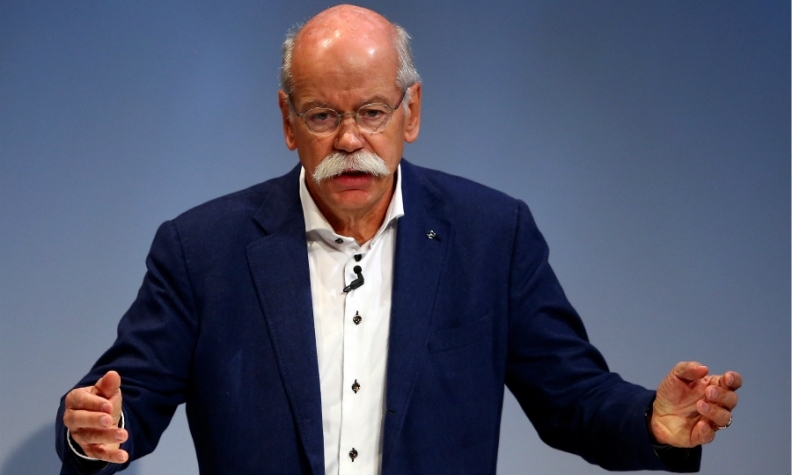 Dieter Zetsche: "The old way of thinking pitting those obsessed with high-powered cars ... against joyless anti-car ecologists has been overtaken by reality." BERLIN -- Daimler CEO Dieter Zetsche braved a frosty reception as the guest speaker at a Greens party congress on Sunday to tell delegates he too wants emissions-free cars on the roads. Zetsche, whose automaker is demonized by many Greens in Germany, said the company had not missed the boat developing electric cars and said it backs climate protection goals. But the executive dismissed their call to ban the sale of new cars powered by gasoline or diesel by 2030. "Many of you probably thought 'Letting the Daimler boss talk about transportation here is like letting [Donald] Trump talk about women's policies'," Zetsche joked to 800 delegates at the environmentalist party's annual congress in Muenster. Yet Zetsche disarmed the Greens by saying he backed one of their central policies for the 2017 election, namely that the car industry's future depends on developing emission-free cars. "It might surprise some of you but I agree entirely," said Zetsche. "The decarburization of industrial nations is necessary and carmakers will have to play a role," he added. Even though demand for cars keeps rising globally, "we'll have to cut the CO2 emissions of all the cars we manufacture. We'll live up to our climate policy responsibilities." Zetsche told journalists at the Paris auto show in September that Daimler's Mercedes-Benz will launch 10 new electric cars by 2025, and zero-emission vehicles will make up between 15 percent and 25 percent of overall Mercedes sales by then. Zetsche, one of the most recognized faces of industry in Germany, insisted the Greens and carmakers have much in common. "Those who see carmakers as the root of all evil might not have noticed every second electric car in Europe is made in Germany." "The old way of thinking pitting those obsessed with high-powered cars ... against joyless anti-car ecologists has been overtaken by reality," he said. "That's good too because the transformation the car industry is facing will have an impact on the whole country." The Greens were in power at the federal government from 1998 to 2005 but have been in opposition ever since, even though they share power in coalitions in 10 of Germany's 16 federal states. The party is emerging as a preferred coalition partner after next year's election for both the conservative Christian Democrats and the center-left Social Democrats (SPD).